All times are in NZDT Timezone. Grids will a "Heat Style" Everyone gets a front, middle and rear grid starting position. All races have a 70% DNF threshold - No points if you don't get to that race percentage. All races have cross the finish line bonuses, so get that car repaired and finish the race. 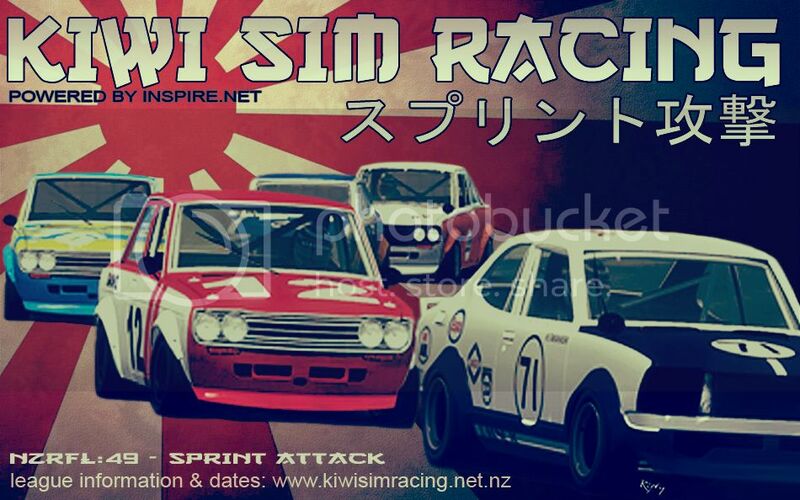 Sign up at the usual points site http://points.kiwisimracing.net.nz. Follow the instructions, post back here if it all gets too hard. When signing up to the points site, use the number of the vehicle you've chosen. There is a teams championship as well, so grab a team mate and register your team on the points site. When crossing the finish line, crashing your car is not acceptable, nor is any Voice Coms chat until the last person has finished. Driver's are still racing, and racing for position, and it is unfair to disrupt their racing. Pull over off the track and Esc, or drive back to the pits. There will be NO talking on Discord during qualifying. Race/Qualifying chat is to be kept to a minimum, and if necessary keep it minimal and session related only. People are racing and don't need to here about your day, or a long chat regarding an incident. There will be plenty of time after qualifying/racing to talk. League Starts 6th November 2017. What's happening with this - week 1 next week? Are we having official practise tonight? Or is the date stated for a practise next week? Edit - all sorted after rF2 crash and subsequent gMotor errors, unsubscribed and resubscribed to reinstall mod. I'll be slow, only had the wheel out a few times in the last couple of years. Can someone PM me the round 1 results, and I'll update the points site today. Sorry for the delay, but all results are done and up to date.